Set in the northeastern area of The Borderlands. Both characters are in lupus form. All night long it stormed. They traveled only until shelter was found, and there huddled as lightning lit the dark sky and great cracks of thunder caused them to jump and bristle all over. Sometimes they talked, but mostly they tried to sleep. This was terribly difficult, though when sunlight came the next day it did so only enough to illuminate the lingering rain and suggest they would be hindered further on their progress. Despite this, by the mid-morning the clouds dissipated and left behind soggy ground over which they now crossed. The larger wolf was ahead, picking his way across the mud and sniffing at fresh tracks. Despite the miserable conditions they would be able to find trails – Degaré had his nose above a deer's track, which he sniffed deeply and considered. The smaller canine behind him, brighter in color and with more obvious domestic heritage, was watching the surrounding woodland. It was obvious why, for the right side of the wolf's face was scarred and his eye there was milky and non-seeing. Despite this he moved with a certainty as he followed the muddy trail, eager to fill his sunken belly. It was rare for the Eklund to be beyond the Vale’s borders for so long, particularly, without her horse, her marten companion, or her gear. She had been itching to move though, to stretch her legs and scout the countryside as she had done when she had run with Boreas in what seemed like a lifetime ago. Unfortunately, her attempt at both gathering information of the lands beyond the Vale and to cure her restlessness had ended up with Ragna having to stay out longer than she would have liked. A freak summer storm had rolled in quickly, and she had been forced to take shelter and weather out the night. At daybreak, she had moved on. In her journey back to the Vale, she had found a few tracks in the damp soil. Precious little of them were of any great interest though. That was, until she found a set of footprints belonging to not one, but two canines. The pair—whoever they were—seemed to be following alongside deer tracks, likely with the intent to hunt. From their scent trail, she had gathered that they were two males, one smelling rather wolfish, the other, more like a coyote. The consideration had made her initially wary as the memory of Salsola and Inferni working in tandem with one another to destroy the Boreas faction came to mind. It was a feeling that she shook off and replaced with the determination to figure out who these two individuals were. She had lasted over a year without the safety of another Luperci to watch her back, had survived the massacre of her warband’s final fight, had survived the Sctintilla scum of her homeland, she was not about to let herself die now. So, when she initially came upon them, she went through painstaking measures to mask her presence until she had fully assessed what kind of threat level they possessed to her. The larger of the two was obviously wolf and looked to be tracking the pair’s next meal. His companion was smaller, red-furred, and long-earred, and looked to be more concerned with the surrounding area than sniffing at the moist earth beneath their paws. With the wolf looking as malnourished as he was, Ragna surmised that the pair—or the wolf at least—did not have the best skills suited for sustaining themselves on the Loner lifestyle. If nothing else, if she had to bolt, she would probably be able to outrun them with endurance alone. It was to this confidence that she wove her way back to their trail, separating from the woodland at a safe distance behind—so as to not make them immediately jumpy—them when she decided to make her presence known if it had not already been felt. “What makes you think that you’ll be able to catch a deer if you find it?” She asked, her tone a mixture of general curiosity with an overarching feeling of critical judgement. Her icy gaze flicked between the two men. When he had lost his right eye, Degaré had become keenly aware of his other senses – paranoia had aided him greatly, for he had never fully shaken the fear of the cougar from his mind. Death had all but found him that day, and it was miraculous that he had lived at all. That was why he had gone with Talbot. That was why he had followed him all the way south and then north again, when greater things called them. Degaré lifted his head and turned his ears to listen. His attention lingered behind as Talbot looked from one end of the trail to the other. He was the first to spot the woman and his half-curled tail flagged up like a deer's. The bigger wolf turned his good eye towards the source of his companion's concern, pricking up with obvious alertness. He bristled at her question, but Talbot was speaking before Degaré's rumbling growl could be formed. Teamwork, the doggish hybrid told her. All good things come to those who keep the faith. They’d turned to face her almost immediately. The wolf seemed irritated by her question, and her narrowed a fraction in her amusement by it. His face was scarred, much like her own, though, it seemed he was less fortunate than she. Where hers covered a larger area, his had taken one whole eye from the look of the milky thing that settled upon her without truly seeing her. Either annoyed by her presence or her words, she would never know, for his friend spoke for the two of them. The tip of her ear flicked at his words. “I suppose your friend’s faith is rather absent then,” she remarked, pointedly looking at the wolf’s scars and slighter figure. She had had her feel of higher beings and gods. If the destruction of her friends and comrades meant anything, it was that there was none, or, at least, none that were on her side. Degaré was thin – he had not been like this always. It had not been the recent years which had done this to his body, but the moment he had left home. Wounded and frightened, his skills had been enough to keep him alive, but he never thrived. Where muscle and weight might have formed instead his body stretched to what capacity it was allowed, sunken and hollow in places where starvation had touched him and lingered. Once they reached The Watchtower, he had not gone a day where hunger had been so debilitating. He never forgot it, and his body never fully recovered. He was alive though. There was a reason for that. His growling quieted at a look from Talbot, and set to looking unhappily at the strange woman. Her open judgment struck the parts of him which remained raw and exposed from trauma, though his irritable glare returned this in kind. All suffer before they find the truth, the red coydog said pleasantly. He had a smooth politicians voice, and made friendly signs with his tail. But we do all right. If we are meant to eat, we will – beg pardon for our ignorance, but what is Krokar? We're not from around here. Had she had her weaponry and gear, Ragna might have considered how far she could push the scarred wolf until he snapped. He didn’t seem like a very verbal creature, resorting to quieted growls and glares in her direction. If he knew how to speak, he was either submissive to his smaller companion or he thought it wiser to let the coyote-mix speak on his behalf. The possibility of him being a slave to the other was something to consider too…perhaps he was blindly loyal to the other despite being half starved. There was so much to be made in speculation, but the coyote-dominate one spoke again, his words smooth and diplomatic as they had been before. She let out a sharp, dismissive exhale at the religious-like talk. Ragna had suffered time and time again. She had lost so many comrades to Sctintilla, had lost her brother to an endless war, had lost all of her warband to the Thistle Kingdom and Clan, had lost her best friend, had been stranded in this godforsaken land for months and unable to return home without shame. She had been beaten, harassed, and cut open. The only truth that she had found was the ridiculous thought and practices of praying to a god that wasn’t there. Did the scarred wolf before her have to be a death’s door before he saw whatever truth or faith that the red one spoke of? Damn scavengers. The coyote was probably expecting to come across a carcass, and that was why he was so nonchalant about the matter. “Or would you rather discuss that after we catch the deer?” She flicked her tail, her glacier gaze shifting back to the wolf, trying to gauge if he was intelligent enough to form his own thoughts or if he would continue to react to her in sounds rather than words. He committed to memory what she told them, and marked the direction for what it was. If they came across they pack it would cement the first mark of many to come. Word was that life filled this part of the world, and surely enough this was what the Eyes had long waited for. Degaré met her gaze and looked terribly eager to expose her to a slow death, though to his credit withstood the urge to lash out with violence. This was hard to do sometimes, especially when they were this far away from the Watchtower and rare freedom seemed closed. He had forgotten what it felt like, but wondered at the new fear in his heart. You can't change fate, he told the she-wolf flatly. Of course we can talk, Talbot interrupted, wagging his tail. Let's bring down that deer and talk over it – if that's your intention, miss, he peered at the strange woman, smiling despite his intense, studying eyes. A part of Degaré still hated this part. Putting blind faith in strangers felt strange, especially when they seemed so hostile. Still, if she was going to attack them, or if she had others waiting out there, Degaré would fight and escape. They always got away. Even from that cougar, he had gotten away – though Talbot had been the reason for that, Degaré corrected himself. Well come on, Degaré huffed, dropping his nose to the ground to follow the trail. Oh? Had she struck a nerve? Pointing out his scars? The scarred one didn’t like her, she could see it in the intensity of his one-eyed stare and from the vibe that ebbed off of his still stance. He was a rather thin-skinned fellow if he got so sensitive about them by a mere mention. The thought made her only want to attack the matter more, and had there not been two of them and with her pledging loyalty to the Vale, she might have been more tempted. In Boreas, she would have not had any fear of being kicked out. Mistfell Vale was a softer sort though, and with largely different morals than those she had grown up with. There was a reply—a not so nice one—on the end of her tongue, but the red-furred male drew the conversation into a different direction before she could speak it. She swallowed what she had to say with a teeth-filled smile at the wolf. It was, perhaps, for the better that they focus on other matters if the three of them were to work together in a hunt. Ragna let her eyes narrow a fraction on the wolf before letting them slip away to his smaller companion. “It is,” she confirmed, wanting there to be no doubt that she might have ulterior motives. So long as they did not turn on her, they would not be on the receiving end of her fangs either. 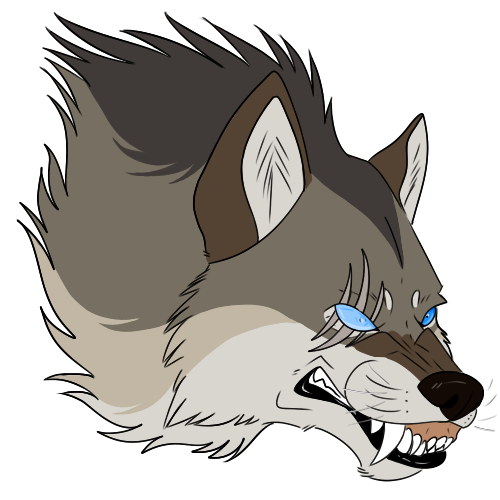 “Lead on,” she said to the wolf’s huff, adding as he began tracking their quarry once more, “I’m sure your nose is better suited for this…” …Than your eyes, she wanted to add, but, there was no point in harassing the wolf any further though. She moved along with the pair, finding small enjoyment with staying on the wolf’s blind side for periods of time before switching when she could no longer justify it. The coyote mix was ever watchful, after all, and it made her wonder what exactly their relationship was to one another. Mostly, she allowed the wolf to roughly decide their heading while she wove about the surrounding area for visual signs or sounds of the deer in which they hunted. She knew the terrain better than they did, from what it seemed like, and suggested alternate routes here and there to prove her trustworthiness in the hunt. They were lucky, the two Loners, that it appeared as if the deer had stopped short of the river system, distracted instead by the foliage to be grazed upon in a small clearing. It was a small group of three, a young buck accompanied by two equally young does. They were of average weight for their size, and looked to be of relatively good health save for one of the does which had a laceration across one if its hips. It didn’t seem to bother the animal too much, but there was an obvious reluctance in the doe when it came time to move. It was probably in pain, a creature in need of reaping. Ragna let out a soft chuff as she drew into a low, stalking stance, her glacier gaze upon the two in silent question of how they wished to proceed. Typically, the scout adopted the role of a courser, but, with how skinny the wolf was and with how small his companion was too, she wasn’t sure how well either would fair with being the one to do the final take down. And, if this hunt were to fail, she didn’t want there to be any way for the blame to placed on her lack of planning. Each hunt was new, and not every hunt was a success. This was the beauty of the thing – even for a wolf like Degaré, who seemed certain to fail more than he found a rewarding end, the opportunity was there. He was thin, and left half-starved from his time alone. While Talbot had managed to save his life, he could not save him from the unseen forces already rife in his blood. What little weight Degaré had put on left him healthy enough to travel and provide for the two of them, though it was harder to catch big meals when they were in unfamiliar land. With the help of Ragna, the pair – Degaré now being the pushier of the two, with Talbot's bright form trailing – made their way through overgrown brush and patches of woodland where passage narrowed. With their quarry found, what came next was the matter of the final part of this dance. Satisfied by what he saw, Degaré repositioned himself and examined the grounds below. The river would cut them off, he reasoned. If the deer scattered, they would have a better chance to catch one. Unable to see from the distance what Ragna had spotted already, Degaré shifted his weight and turned towards Talbot, who slunk forward. He dropped to his belly, eyes locked forward. Degaré pointed with his nose to suggest an opposite direction to Ragna before he slipped off. The pincer movement would help them narrow down opportunities to escape for the deer, who did not realize the approaching wolves until Talbot finally betrayed his position. He brayed like a hunting dog and charged the herd, spooking it. When Degaré appeared to cut off their exit, they floundered – Ragna had moved by then, and between the three of them it was an affair of muscle and savagery that shed blood and soon had meat filling their mouths. When the bulk of the feasting was done, Talbot gave a great stretch and began licking his face clean. His empty-sky eyes looked sharp despite the sensation of drunkenness all the meat in his belly had left – obvious in his languid posture. Degaré was still working on the carcass. Do you believe in something greater than this world? She watched the wordless, but universal commands that were given by the wolf. He indicated a direction opposite of her to his companion before slinking off. With the red-furred one settling in, Ragna took that as her cue to set up the rest of the ambush. If she had read things right, it looked as if the scarred one wanted to use his smaller companion to chase the deer, and the two of them would cut the one they wanted off. He had made no indication of which that they would be after, though, she supposed, if they were good predators, they’d realize relatively quickly which deer would be the best to target. When everyone was in position, the coyote-hybrid one exposed himself with a decidedly doggish noise. It was definitely different than anything she had ever heard from a Luperci, but, it got the deer moving nonetheless. The startled animals turned and ran, the injured one doing its best to limp quickly along after the group. Towards the one-eyed wolf they bolted, only for him to surprised them and have them change direction. Scared and trying to evade the predators, the group’s fleeing movements made it difficult for the one doe to keep up. Ragna dove into the fray, and, with the help of the two males, they managed to take down the injured doe. They ate their fill, the two men eating more than they probably should have. Being Loners though, it was understandable without the promise of a next meal. Ragna, meanwhile, could eat until she was merely satiated, knowing that there was plenty to be had once she returned to the Vale. While the scarred male continued to stuff his face, the Eklund laid on her side, licking her paws clean of whatever blood or entrails might have touched them during the shared meal. Her icy gaze flicked to the red one when he addressed her. Ragna let her tongue glaze over her whiskers as she gave him her full attention. “I did once.” She raised a lip. “But God forsook me and my people when we were merely carrying out his will. I’m sure I’m no longer welcomed into His Kingdom.” She scoffed.